Barry Award-winning author E. J. Copperman is back with the tenth hilarious installment in his national bestselling Haunted Guesthouse mysteries. 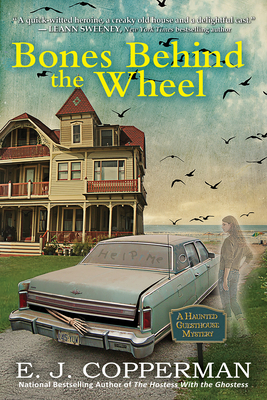 Haunted Guesthouse proprietress Alison Kerby and her ghostly guest detective, Paul, "auto" know better than to dig into the case of a long-buried sedan and its now-skeletal driver. Innkeeper Alison Kerby is determined to keep her mind, body, and soul focused on bringing high-spirited hospitality to her lodgers at the Haunted Guesthouse. She simply has no time for any more murder investigations, no matter what Paul Harrison, her resident ghost detective, says. But this time, the mystery comes looking for Alison. Workers unearth a 1977 Lincoln Continental buried in the sand behind Alison's guesthouse--and they discover a skeleton still belted in behind the steering wheel. Paul, of course, is on the cold case--to the extent that a ghostly gumshoe can be--but Alison is still determined not to do the incorporeal investigator's legwork. Not this time. But her new husband Josh is intrigued, and he offers to help Paul poke into the case of the cold Continental. Uh-oh...has Josh caught the investigation bug? It's a harsh wake-up call for a harried businesswoman who'd thought she'd told the detective life to hit the road. What can go wrong? How about everything? As Alison dodges stray bullets, discovers a gun in the guesthouse, and reluctantly probes a decades-old murder that turns out to be shockingly relevant even today, her specter inspector tries to keep her spirits up. But as she searches for the key to unlock the case, is Alison headed for her final check-out? Make a reservation to find out in Bones Behind the Wheel, the tenth fun-filled Haunted Guesthouse mystery from national bestselling author E. J. Copperman. E. J. Copperman is the author of a number of mystery series, including the Mysterious Detective series (Edited Out), the Haunted Guesthouse series (The Hostess With the Ghostess) and with Jeff Cohen, the Asperger's mystery series (The Question of the Dead Mistress). E. J. 's newest, the Agent to the Paws mystery series (Bird, Bath, and Beyond). It is exhausting for E. J. just to think about it. E. J. lives in New Jersey.